This site has been created to introduce you to Greentree Naturals certified organic farm and offer some perspectives of ways we feel have helped us become more successful as a small acreage farming enterprise. We have added a few updates. Check out our Winter 2019 Newsletter, On Farm Research page, About Organic Certification page, the new Planning the Garden CD, new CSA newsletters and the What's Happening on the Farm page for workshops and events. We've also added new information about Visiting the Farm at the bottom of this page. Please visit us on our Greentree Naturals Facebook page for frequent updates. On this page, we also have added a link to a television program that our local Spokane, Washington PBS station filmed featuring Greentree Naturals in 2012. We are receiving frequent information requests that are asking us how to do what we do. While, on the one hand, we do not want to give away the hard earned knowledge that we have learned about being successful small acreage growers, we feel it is very important that more people are exploring the possibilities of becoming small acreage farmers. We believe that our experience has value. We are proud of what we do. We hold a passion for this land and the whole process of nurturing our gardens. This is the stewardship of the land that we hope to encourage others to accept. The large farms across the country are slowly being lost to over-production and high land taxes. It is the small acreage organic farm that will be the wave of the future. Populations all over the world rely on local farms for fresh produce. In this country, most of the food we eat comes from many miles away and the connection between the farmer and the consumer has been lost. We hope to educate our communities of the importance of supporting the local small acreage farmers and market gardeners and encourage others to do the same. It is our mission at Greentree Naturals is to provide fresh, nutritious, high-quality certified organic produce to our local community. We provide a place for organic gardening workshops; hands-on learning through agricultural related activities, and on-farm research. We are committed to forging partnerships with other farmers and educators, working together to create a more sustainable future for our community. Our goal is to empower the next generation of small acreage farmers and eventually establish a ‘demonstration farm’; a place where farmers and students of sustainable agriculture can meet and learn about organic gardening techniques and discuss technical and management issues. Our garden serves as a hands-on classroom during our workshops. We are committed to providing opportunities for all ages of people to get involved with organic food production. We hope to empower conscious eaters by connecting visitors with their local food system, while demonstrating how food gets from the field to your plate. If you believe in what we are doing and would like to make a donation or become a sponsor for any of our projects, we welcome your charitable contributions. Your sponsorship and contributions help maintain the farm, gardens and animals, as well as support our school field trips, apprenticeship and mentorship programs, adult educational workshops, and more. Please support our work by making a donation. 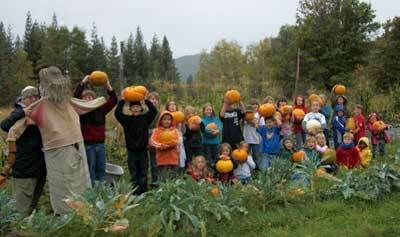 Greentree Naturals is a small acreage certified organic farm nestled between the Cabinet and Selkirk mountain ranges outside of Sandpoint, Idaho. 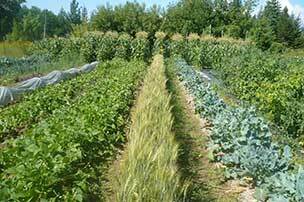 Our farm has been certified organic by Idaho State Department of Agriculture since 1992. Diane Green and her husband Thom Sadoski own and operate Greentree Naturals. 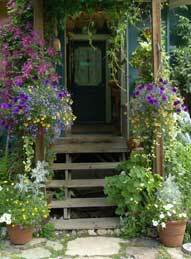 The farm produces an amazing diversity of vegetables, herbs, flowers, gourmet garlic, hops, seeds and berries. Greentree's system includes growing and marketing over 90 different varieties of certified organic and heirloom vegetables using cover crops that fix nitrogen and provide organic matter for the soil, crop rotation, planting habitat areas for beneficial insects, and utilizing composting and vermicomposting to keep the soil healthy. Greentree Naturals products are marketed both wholesale and retail within a 50 mile radius of the farm. We sell to local fine dining establishments, at the farmers market, a natural foods store, an on-farm stand, and through a Community Supported Agriculture (CSA) model. Local sales create a direct connection between the farm and the people who buy and eat our locally grown produce. Through the CSA, our members receive a weekly share of fresh, nutritious produce during the peak of the growing season. CSA members receive bountiful bags of fresh, certified organic produce delivered right to a member's home or office in Sandpoint. Greentree Naturals is home to many outreach activities, including summer farm tours, organic gardening workshops, school group visits, and on-farm research. We are passionate about being able to share our knowledge and provide unique learning opportunities through our on-farm mentorship program that will help create future organic farmers. Diane teaches a comprehensive series of on-farm organic gardening workshops for both beginner and experienced gardeners that cover the philosophy and techniques of organic gardening and sustainable small scale farming. She also provides education programs and consulting for organic gardening, small acreage farming, business planning, and sustainable agriculture through Greentree Naturals (see Seminars & Workshops page for more information). Diane is an experienced farmer mentor who has been offering education, guidance, moral support and encouragement through Greentree Naturals Mentorship program. She has been actively involved with the University of Idaho Cultivating Success Program since it began in 1997(www.cultivatingsuccess.org) and offers academic internships as well. This is a short video (approximately 8 minutes long) about Greentree Naturals, produced by KSPS Public Television, Northwest Profiles program out of Spokane, Washington 2012. Marketing is a large part of the Greentree business. "We believe that diversity in our farming practices is every bit as important as diversity in our approach to marketing our crops." 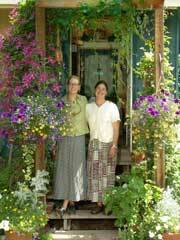 Diane and Thom have carved out a valuable niche by growing a wide range of unusual and hard-to-find produce and herbs. They grow 37 different kinds of salad greens, 60 culinary herbs, 15 varieties of squash, 8 kinds of peppers, 7 varieties of eggplant, and much more. Greentree carrots come in four different colors: orange, yellow, red and purple! They get top dollar for these unique crops that chefs can't get through the normal produce suppliers. Cooperation has been another key to making their business work. During the season, we often purchase berries, fruit and other produce items that we do not grow to make them available for our customer base. Rather than try to grow everything, we support other local organic farms this way and are able to provide more variety for our CSA members. 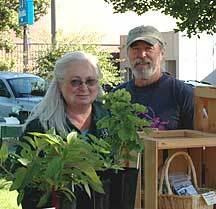 From 1998 - 2006, Diane managed a local Growers' Collective, marketing several farmers' combined produce through the CSA, farmers' market and restaurants. "By ourselves, we couldn't meet the demands of the market, but by working together, we all are able to improve our sales," she says. "There's also safety in numbers. If one of the growers has a crop failure, we can count on one of the other farms to meet the order, so we don't lose a customer." Each farm in the Collective was at a different elevation, enabling them to extend the availability of crops through a longer growing season. The Collective worked together to provide the ability to fill larger orders. Though the growers market their products collectively, they don't do so anonymously. "We always let the buyers know that “these summer squash come from Wattcliff Farm, these onions come from Almost Eden Farm, and so on." Anytime we bring in produce from other farms, we make sure that our CSA members know where their food came from. This is an excellent model to work with and I am certain that we will do it again. For more details, visit the Growers Collective link. Greentree Naturals is a working farm, which means quite simply, we are working. Please call ahead to find a mutually convenient time for your visit. We are willing to make an appointment for you to come out for a visit and encourage you to call or email to set a time and date that works around our farming schedule. We really love sharing the beauty of our place, it’s just that every time we stop to show what we are doing, we are no longer moving forward with what has to be accomplished to generate income to survive. Visitors are welcome, but on the understanding that they use the area at their own risk and they assume responsibility for injury, damage or loss to any individual or their property. We ask you, for everyone’s safety and peace of mind, to respect and follow our procedures outlined below. If you want to put on your grubby clothes and come out and help us work, we might be willing to let you have that experience (make an appointment). We might even consider hosting a private party on the farm for a fee and are willing to work with our local chef to make this personal affair an event everyone will remember forever! Otherwise, you might have a better chance of seeing the farm by attending one of the events listed on the What's Happening on the Farm page. Please park in the areas provided. Come Prepared - Farms are not necessarily accident proof and definitely not weather proof. Come dressed for the weather, in clothes that you won’t mind finding mud or manure on at the end of the day. Wear sturdy, closed-toed shoes to protect your feet and make it easier to walk on the uneven ground. Bring your own water and a snack. Absolutely no pets - Please be aware that Greentree Naturals does not allow dogs on the premises. We have farm dogs that take their job as protectors of the farm very seriously and want to ensure the greatest safety of all visitors to the farm. Mind Your Feet – Stay on the paths. Be careful as you walk, as the ground is rough and uneven. Plant roots and the soil itself need air to stay healthy, and it is easy for them to get sick when the soil has been compacted. Don’t walk in the plants’ bed! Stay on the path and teach your children to stay on the path! Shoes are required on the farm. No barefeet! We advise against wearing open-toed shoes. Pick Only What You Are Invited To – Remember that the farm’s products are its income. It can be tempting to help yourself to the beautiful food you see. But just as you wouldn’t eat a box of strawberries as you stroll through the grocery store, it is also not appropriate to snack your way through the farm. Be a good guest, and remind your kids to do the same. Taste things only if you are invited to do so. There may be an opportunity to purchase something to take home at the end of your visit. Your farm visit can be a wonderful opportunity for you to model the learning process with your children. Make sure your children are respectful of the farms rules. Be curious. Wonder aloud. Ask questions and listen carefully. Take in this new knowledge and go home more connected to the land.